In the 1960s, Stephen Hawking (Eddie Redmayne) met and fell in love with Jane Wilde (Felicity Jones) whilst he studied physics at the University of Cambridge. However, as he begins suffering from motor neuron disease, their relationship starts struggling under the pressure on Hawking both as a physicist and a person. As his disease worsens and their relationship continues, both Stephen and Jane Hawking are faced with countless challenges, each bigger than the last. I have to begin by stating that the trailers fail to give this film the justice it deserves. 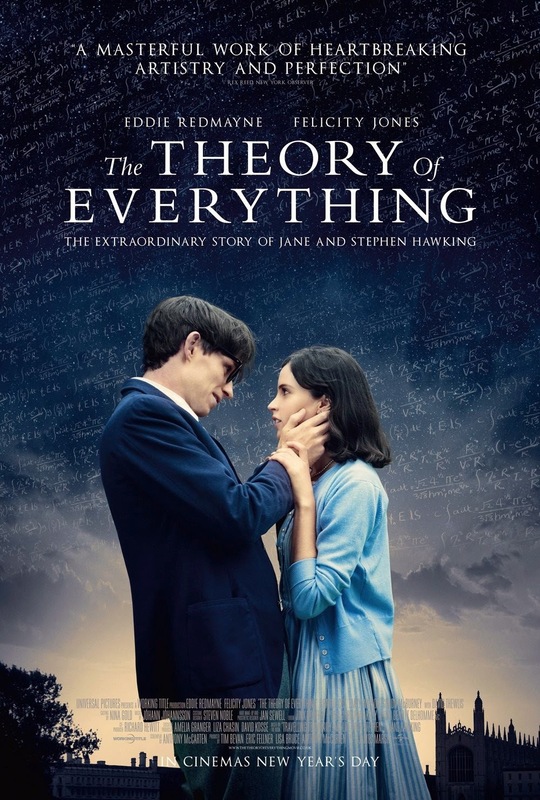 If you went online or to the cinema and saw any of the trailers for The Theory of Everything, you will undeniably be expecting a glossy, loved up romance film that happens to include world renowned physicist Stephen Hawking. Alas, that is not the case. And thankfully so; boosting the happiness of a true story leaves the film in danger of translating as fake. Nothing about The Theory of Everything comes across as fake, fortunately, thanks to the stellar work from the film's director and cast, who each give their best. It is, after all, them who make The Theory of Everything such a triumph, even with its flaws. But we can arrive on those later, as for now undivided attention must be given to the performances of Redmayne and Jones, who both earn their nominated positions in the various awards ceremonies. Redmayne gives a career best performance as Hawking, shedding light not only on the darker, upsetting periods of his life, but also on his personality. Theory does a terrific job of making Hawking a likeable, even relatable character, despite the improbability that any cinema-goer will have experienced similar life events. In the films lighter hearted moments, Redmayne gives us the opportunity to smile at this film, even if these moments are sandwiched between something much more serious. Jones also gives a fantastic turn as Hawking's now divorced wife, creating likability and sympathy in equal measure, and allowing us as an audience to rely on her almost as much as Hawking did himself. Theory has many scenic highlights, but the film remains at its best when the camera lies solely on Redmayne and Jones. In my earlier review for Angelina Jolie's war drama Unbroken, I criticised the lack of cinematic substance and the mediocrity of the film's visual appearance. This was a trait I feared would reappear in Theory, but thankfully director James Marsh and cinematographer Benoit Delhomme construct this film with a visual resplendence that keeps the audience interested in the film visually as well as emotionally. The moment of Hawking's fall early on in the film's narrative is framed and presented exceptionally; those life changing seconds are simultaneously mesmerising and horrifying. Despite occasionally falling case to stereotypical conventions (those filtered, flickery flashbacks certainly didn't help), the film regains its stride with its final sequence; a rewound, reverse chronological presentation of sequences from the film, taking us back in time, acting as a metaphor of Hawking's own theories. It's a stunning sequence. But, regrettably, Theory is not a perfect film. Whilst it remains captivating from beginning to end, Marsh struggles to find anything to build towards. Adapting a true story is far simpler when the case subject is no longer alive, but when your protagonist is still presently living and continuing his life's work, where do you end the film? The answer to this question, unfortunately, is unbeknownst to Theory's writers. Watching Hawking grow as a physicist and a person throughout the film is always compelling, but you never quite get the sense of any real forward momentum. We seem to always remain stuck in the present (and, occasionally, the past) without any real knowledge that the film will continue to another scene. This slight downfall is then reaffirmed by the film suddenly lurching into its conclusion, following a scene that has no more emotional or narrative connectivity than any other. One minute you're happily watching what you'd probably believe to be a pretty standard scene, then suddenly we fade to black and the credits begin. For what is generally a well paced film. the ending is just a bit too jarring to feel smooth. But this has little to no effect on Theory's first two acts, albeit it is difficult to determine when the final act begins. Both Redmayne and Jones were so terrific I ran out of room to praise this film's supporting cast. Charlie Cox, Emily Watson, David Thewlis and Harry Lloyd are all just as superb, simply subjected to less screen time than the two leads. This is undeniably a fascinating story with superb characters, and it genuinely makes me wonder why it's taken so long to adapt this to the big screen. Thankfully, though, it is clear that a vast amount of time and care has been put into this film, and we are left with a beautiful story told effortlessly well, with a nice visual style to support it. Angelina Jolie, watch and learn. To Summarise: Despite frequently losing narrative focus, The Theory of Everything is a powerful drama, aided by an astonishing true story and exceptional performances from its two leads.